The Sheer Classic Screens are designed to accommodate openings up to 40 feet in width and 125” in height using single or multiple joining screen panels. The Sheer Classic Screen is offered in several different configurations depending on the specific door design and dimensions. Scroll to the bottom of this page for additional product information details. Opening Width *: 24" 25" 26" 27" 28" 29" 30" 31" 32" 33" 34" 35" 36" 37" 38" 39" 40" 41" 42" 43" 44" 45" 46" 47" 48" 49" 50" 51" 52" 53" 54" 55" 56" 57" 58" 59" 60" 61" 62" 63" 64" 65" 66" 67" 68" 69" 70" 71" 72" 73" 74" 75" 76" 77" 78" 79" 80" 81" 82" 83" 84" 85" 86" 87" 88" 89" 90" 91" 92" 93" 94" 95" 96" 97" 98" 99" 100" 101" 102" 103" 104" 105" 106" 107" 108" 109" 110" 111" 112" 113" 114" 115" 116" 117" 118" 119" 120" 121" 122" 123" 124" 125" 126" 127" 128" 129" 130" 131" 132" 133" 134" 135" 136" 137" 138" 139" 140" 141" 142" 143" 144" 145" 146" 147" 148" 149" 150" 151" 152" 153" 154" 155" 156" 157" 158" 159" 160" 161" 162" 163" 164" 165" 166" 167" 168" 169" 170" 171" 172" 173" 174" 175" 176" 177" 178" 179" 180" 181" 182" 183" 184" 185" 186" 187" 188" 189" 190" 191" 192" 193" 194" 195" 196" 197" 198" 199" 200" 201" 202" 203" 204" 205" 206" 207" 208" 209" 210" 211" 212" 213" 214" 215" 216" 217" 218" 219" 220" 221" 222" 223" 224" 225" 226" 227" 228" 229" 230" 231" 232" 233" 234" 235" 236" 237" 238" 239" 240" 241" 242" 243" 244" 245" 246" 247" 248" 249" 250" 251" 252" 253" 254" 255" 256" 257" 258" 259" 260" 261" 262" 263" 264" 265" 266" 267" 268" 269" 270" 271" 272" 273" 274" 275" 276" 277" 278" 279" 280" 281" 282" 283" 284" 285" 286" 287" 288" 289" 290" 291" 292" 293" 294" 295" 296" 297" 298" 299" 300" 301" 302" 303" 304" 305" 306" 307" 308" 309" 310" 311" 312" 313" 314" 315" 316" 317" 318" 319" 320" 321" 322" 323" 324" 325" 326" 327" 328" 329" 330" 331" 332" 333" 334" 335" 336" 337" 338" 339" 340" 341" 342" 343" 344" 345" 346" 347" 348" 349" 350" 351" 352" 353" 354" 355" 356" 357" 358" 359" 360" 361" 362" 363" 364" 365" 366" 367" 368" 369" 370" 371" 372" 373" 374" 375" 376" 377" 378" 379" 380" 381" 382" 383" 384" 385" 386" 387" 388" 389" 390" 391" 392" 393" 394" 395" 396" 397" 398" 399" 400" 401" 402" 403" 404" 405" 406" 407" 408" 409" 410" 411" 412" 413" 414" 415" 416" 417" 418" 419" 421" 422" 423" 424" 425" 426" 427" 428" 429" 430" 431" 432" 433" 434" 435" 436" 437" 438" 439" 440" 441" 442" 443" 444" 445" 446" 447" 448" 449" 450" 451" 452" 453" 454" 455" 456" 457" 458" 459" 460" 461" 462" 463" 464" 465" 466" 467" 468" 469" 470" 471" 472" 473" 474" 475" 476" 477" 478" 479" 480"
Opening Height *: 24" 25" 26" 27" 28" 29" 30" 31" 32" 33" 34" 35" 36" 37" 38" 39" 40" 41" 42" 43" 44" 45" 46" 47" 48" 49" 50" 51" 52" 53" 54" 55" 56" 57" 58" 59" 60" 61" 62" 63" 64" 65" 66" 67" 68" 69" 70" 71" 72" 73" 74" 75" 76" 77" 78" 79" 80" 81" 82" 83" 84" 85" 86" 87" 88" 89" 90" 91" 92" 93" 94" 95" 96" 97" 98" 99" 100" 101" 102" 103" 104" 105" 106" 107" 108" 109" 110" 111" 112" 113" 114" 115" 116" 117" 118" 119" 120" 121" 122" 123" 124"
The elegant Sheer Classic Screen is designed to accommodate openings up to 40 feet in width and 125” in height using single or multiple joining screen panels. The Sheer Classic Screen is offered in several different configurations depending on the specific door design and dimensions. 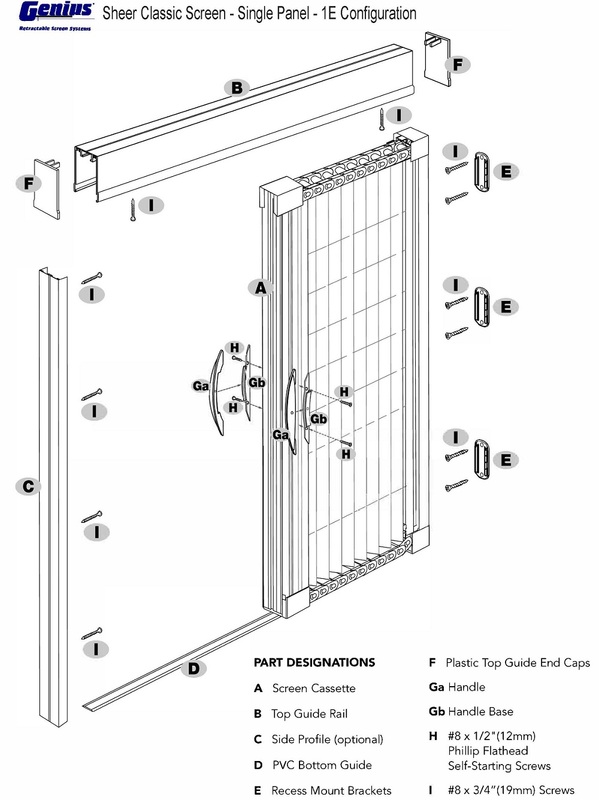 The low profile bottom guide on this screen is wheelchair accessible and ADA compliant. The Sheer Classic Screen Systems can be easily removed for storage during inclement weather or for prolonged periods when the screens are not in use. NOTE: The Height of Each Screen Panel Must be at Least 10" (250cm) More Than the Panel Width.